You would swear some out-of-towner deceided to drop these BEAUTIFUL site signs down on our two sites. I'm taking bets on how long they last before the neighborhood characters vandalize them - I'm hopeful - but realistic. 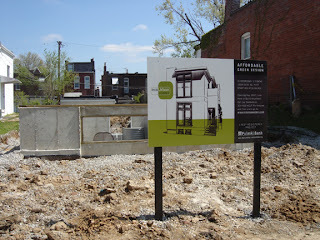 We deceided to go with the modern facade for both signs even though the two homes on Magnolia will be historic. I felt it more important to have a common look and feel rather than attempting to confuse passer-bys with multiple signs. Your feedback is always appreciated. ECO! ECO! ECO! ECO! ECO! ECO! ECO! hey! i heard that the first homes are being delivered soon. what's the story? i'd love to check them out.